New research has suggested that growing customer anger at poor signal could aid the business case for investment in 5G networks. A study from RootMetrics has found that just 53 per cent of Brits are happy with their mobile upload and download speeds, but 79 per cent said they would be willing to pay marginally more for faster speeds or a better service. That situation occurred when the first 4G services went live in the UK. Of the four major operators, only Three declined to charge a premium for access to the fastest speeds. RootMetrics’ study suggests that a similar tactic could be employed with 5G, but it should also be noted that price (63 per cent) is still the most important factor in choosing an operator. The efficiencies afforded by 5G radio technology and the spectrum earmarked for deployment should result in faster speeds and higher capacity, but much of this will rely on macro infrastructure such as small cells that densify coverage. The cost of equipment and rollout, combined with the difficulties in obtaining planning permission. could make this a laborious and costly task. However RootMetrics hopes its survey will increase optimism. “5G will flush everything out and become a ubiquitous technology for connectivity in metro areas – no more Wi-Fi,” said Kevin Hasley from RootMetrics. “At the moment operators in the UK are involved in a bit of a cat and mouse game with each other and government about who will invest first in the infrastructure. Clearly mobile operators need to plan their capital expenditure carefully, but 5G will be a key battleground to winning subscribers in the near future and there is first mover advantage here. Some within the industry have called for operators to rollout small cells even before the arrival to 5G, claiming they will support existing LTE networks and futureproof their infrastructure. 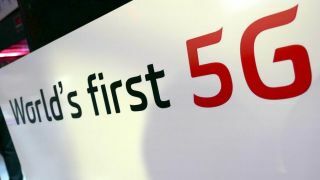 The first commercial 5G networks are expected to launch in the UK in 2020.